Information aka "Paladine", "El Jorobado"
6.27 points at 15 votes (rank 577). 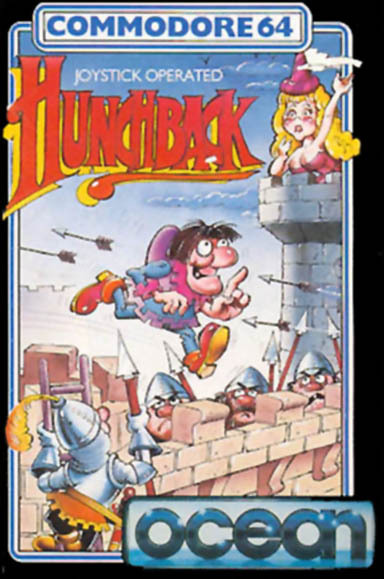 The task of the hero Quasimodo is to rescue Esmerelda from the castle of Stronghold. To get there, Quasimodo passes the whole castle first, to then climb the battlement at the place furthest away. After that he needs to fight his way back to the castle through a row of switching screens - which shows that Quasimodo was not one of the brightest. 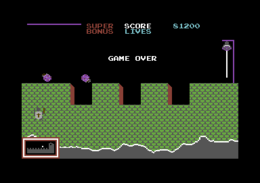 In every screen the player has to manage simple jump'n run tasks, which sometimes need good timing, as you are - additionally to the obstacles - shot at with arrows or strange purple flashing stones from the left and right. As a time limit works a guard, who slowly climbs the wall and catches Quasimodo, if he should take too long. 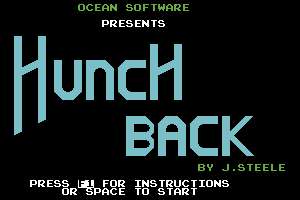 Graphically "Hunchback" is simple but functional, nice details such as a nicely swinging rope and a single pixel that hints at Quasimodos hunch, raise this impression a bit. Musically, the game offers a unisonous tootie version of a known melody (whose title I just can't remember). As soon as the game starts, you get only offered - partially strange, partially adequate - sound effects. If Quasimodo makes it to rescue his Esmeralda, she will right away get kidnapped again and the game starts anew with a slightly higher difficulty grade. The version by "Remember" has next to different trainers (unlimited lives, no time limit, not falling into holes, jump level) also the manual and a saveable highscore list. Werner: "Except for some unfair situations at the end of the game, it can be played quite well." 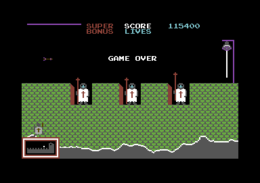 H.T.W: "For 1983 simple, but acceptable graphics with animated sprites but bumpy "scrolling" of the next screen. 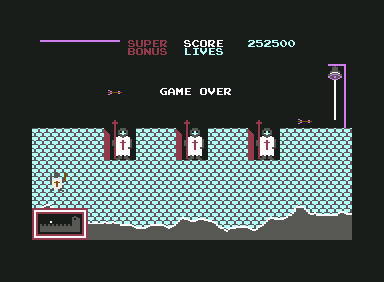 Good playability by precise controls, but little diversity as screens are repeated and only the enemies change. However, an amiable game with charme." This page has been accessed 7,553 times.